Manage cardiovascular problems more effectively with the most comprehensive resource available! 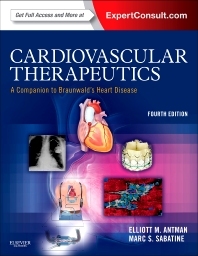 A trusted companion to Braunwald's Heart Disease, Cardiovascular Therapeutics, 4th Edition addresses pharmacological, interventional, and surgical management approaches for each type of cardiovascular disease. This practical and clinically focused cardiology reference offers a balanced, complete approach to all of the usual and unusual areas of cardiovascular disease and specific therapies in one concise volume, equipping you to make the best choices for every patient. Understand current approaches to treating and managing cardiovascular patients for long-term health, for complex problems, and for unusual cardiac events. Benefit from the substantial experience of Elliott M. Antman, MD, Marc S. Sabatine, MD, and a host of other respected authorities, who provide practical, evidence-based rationales for all of today's clinical therapies. Expand your knowledge beyond pharmacologic interventions with complete coverage of the most effective interventional and device therapies being used today. Easily reference Braunwald's Heart Disease, 9th Edition for further information on topics of interest.